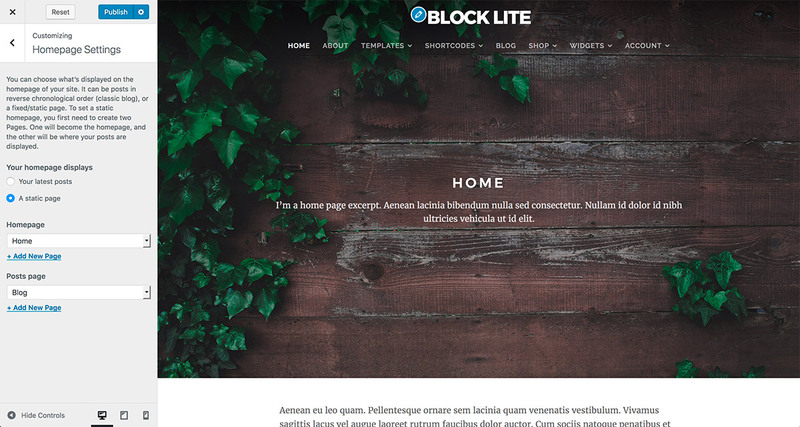 The Block Lite theme is a free WordPress theme. It’s designed to work seamlessly with the upcoming “Gutenberg” content editor. WordPress is the most popular website Content Management System, or CMS. Adding content within WordPress has been roughly the same experience since its release over 15 years ago. Gutenberg changes that experience, entirely. While we think this is a positive step forward for the software, it’s easy to see why this change could ruffle a few feathers. As for Organic Themes, we have embraced Gutenberg. Since its announcement, we’ve been experimenting with the new editor. First, we developed a free custom block for creating personal profiles, and added it to the WordPress.org plugin repository. Then, we published a popular tutorial, outlining how to build a custom block for Gutenberg. 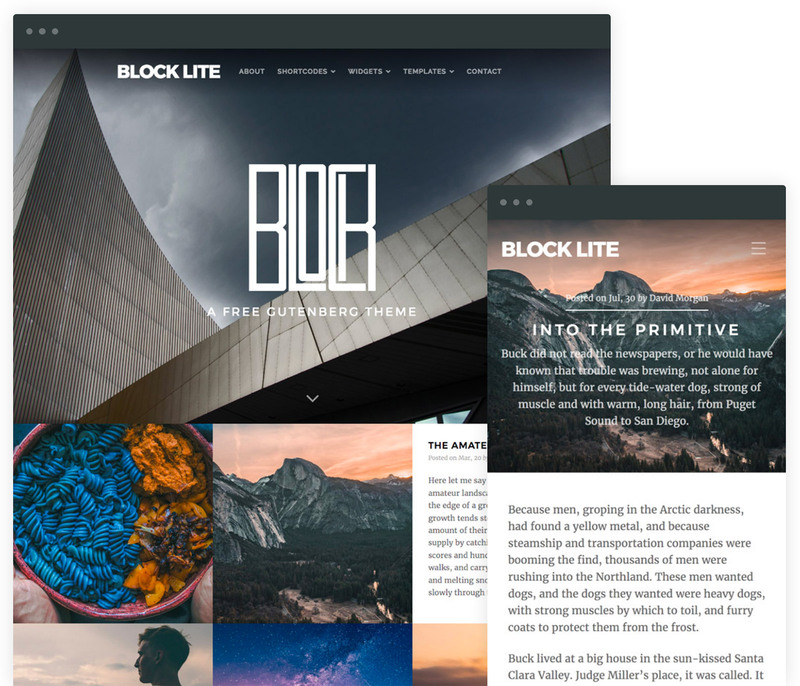 Now, we are releasing a free theme designed to work seamlessly with the Gutenberg editor — the Block Lite theme. We want WordPress users to embrace the new editor as we have. Our goal is to promote early adoption of the new editor, because it is the future of WordPress. So, we are releasing the free Block Lite theme for Gutenberg. Not only does the theme work seamlessly with the new editor — it’s also a really cool theme! What Makes A Gutenberg Theme? Beyond the functions and styles, there is another Gutenberg theme prerequisite — simplicity. Tammie Lister is a core WordPress contributor and the design lead for Gutenberg. She emphasizes the importance of theme developers first getting better at creating themes that do not try to do everything. The basic purpose of a theme is to style the frontend and provide an editor style. The initial setup of the Block Lite theme is simple. However, the layout and functionality can be molded to meet your needs using tools like Gutenberg and Organic Builder Widgets. In this section, I’ll outline the basic setup process beyond the installation and activation of the theme. By default, the theme should display a blog page of your uncategorized posts. A category of your choosing can be selected within the WordPress customizer. Navigate to Appearance > Customize > Homepage Settings. If you would like the blog to display as the home page, make sure “Your latest posts” is selected. Please note: existing posts will need to be published to be visible in the preview window. While still in the customizer, navigate to Theme Options > Blog Options. Select the desired post categories you wish to display on the blog. Setting up a homepage is a similar process. However, you will select a static page to display rather than your latest posts. Select the “static page” option. For Homepage, select an existing page that you would like displayed as your website homepage. For Posts page, select an existing page on which you would like blog posts to be displayed. Keep in mind, no page content will be displayed on that page, only posts. Building a unique homepage can be accomplished using blocks on a full width page template within the Gutenberg editor. This is how we recommend starting the process. Select the Full Width page template. Close the customizer after selecting your static homepage. Make sure the latest version of the Gutenberg plugin is installed and activated by navigating to Plugins > Add New, and searching for “Gutenberg”. Please note: This should not be necessary after the release of WordPress 5.0. Navigate to the page you selected for your homepage under Pages > All Pages. Within the “Document” tab on the right, apply the “Full Width” template under Page Attributes. 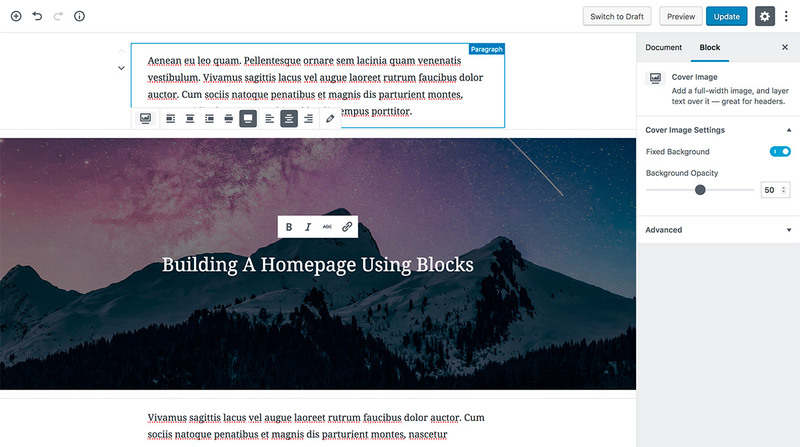 Within the Gutenberg content editor, begin adding your content in the form of blocks. As you build your homepage using blocks, use a variety of available blocks to change the layout and formatting of your content. Since you are using the full width page template, you can optionally make many blocks extend the full width of the browser window. Full width blocks in the Gutenberg editor. The Organic Builder Widgets plugin can also be used to create dynamic page layouts. It provides a collection of 12 custom widgets. Each widget acts as a separate page section, such as testimonials, content slideshows, feature lists, etc. The widgets are added to a page within the WordPress customizer. An example of the Feature List Widget in the customizer. 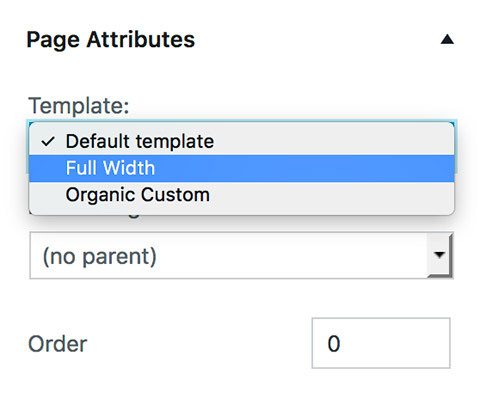 Make sure the latest version of the Organic Builder Widgets plugin is installed and activated by navigating to Plugins > Add New, and searching for “Organic Builder Widgets”. Within the “Document” tab on the right, apply the “Organic Custom” template under Page Attributes. Enter the customizer again, and begin adding widgets to the page. You can see exactly how your page will appear while building it within the customizer using the Organic Builder Widgets. Additionally, Gutenberg blocks can be displayed within page sections using the Subpage Widget provided by Organic Builder Widgets. For more help using Organic Builder Widgets, please refer to our tutorial. That’s it! 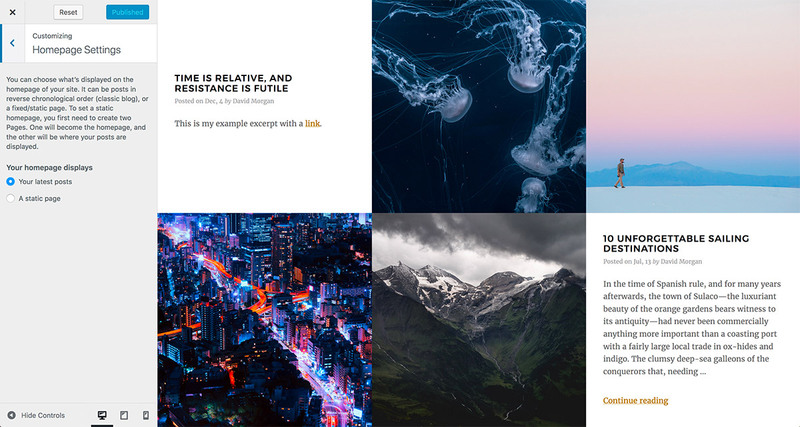 We hope you enjoy the Block Lite theme, and this article has helped guide you through the process of building a beautiful website using Gutenberg and Organic Builder Widgets. With Gutenberg will creating a child theme no longer be necessary? Not necessarily, there may be cases where a child theme is still necessary using Gutenberg. However, you should only need a child theme if you intend on modifying the original theme files. In the event you are only making minor CSS changes to the theme, those changes can be added within the Additional CSS section of the WordPress customizer — without the need for a child theme. Child themes are one of those things that some developers say are always necessary, but they’re really not. It’s entirely dependent on whether you intend to modify core theme files. If you’re not a developer, you probably do not need a child theme. This theme is great. But! I have a problem with videos on main site. If i choose an image in ‘media header’ it looks fine- like it should be. Videos showing up on full screen on preview and HALF screen after the adoption of configuration. On first half its logo and description (with simple header background color), on second half is video. Can i somehow make that vid fullscreen? We’ll be glad to help there. Thanks! This is nice and informative post about the best free WordPress theme with latest Gutenberg support. Hello! I’m a website designer and have a customer who is using your “Organic Non-Profit” theme on their site (v 5.3). If they upgrade to WordPress 5.0, will Gutenberg be supported in that theme? If yes, will there be a theme update available? Thanks for any tips!